Tired of plain old boring straight text? Perhaps sometime you want to wrap text around a circle as we showed you how to do here or make it wavy like a roller coaster. If so, you're in the right spot. Making wavy text is pretty simple to do actually. The most complicated part is getting the wave shape - but we even have a work around for that, if you'd like! 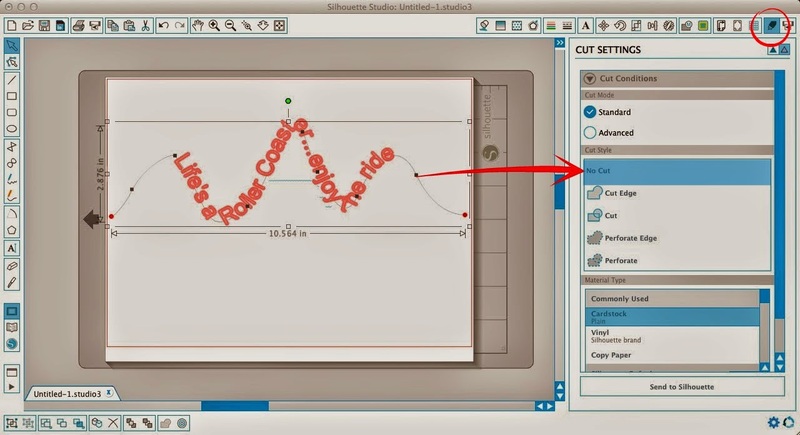 First up, in Silhouette Studio use the 'Draw a Wave Shape' (highlighted in blue on the left sidebar) to draw. You'll first draw a straight line. Then press ESC (to stop drawing lines) and click on the straight line to get the edit points. Then use the edit points to create the waves...you'll be using that little seesaw looking tool to adjust the up and down points in the wave. If you are a perfectionist and just aren't happy with your own wave-making abilities, you can always find a wavy line like this one through a google image search, pull it into Studio and trace it. No worries if you get the annoying double trace line, you're not going to cut the line out anyway. Once you get the wave how you like it, click off the line. Select the Text tool from the left sidebar and type out your text elsewhere on the page. Double click the font so you get the green outline around it. Then click the little target on the bottom left corner. This will allow you to drag the text to the wavy line. If you drop the text right on the line the text will follow the wavy line's shape. You can keep moving the text around the line to get it positioned just how you like it. I sometimes need to add extra spaces between words or letters if they're in a dip and are too crowded. Now to cut the text without cutting the actually wavy line go into the Cut Style tool. Select the line as 'No Cut' while keeping the font as 'Cut'. That's all there is to cutting a wavy line of text in Silhouette Studio. If you want your text to wrap around a circle, check out a that tutorial here. This is great but I cannot seem to copy, save, or mirror it the end result. Any Ideas?! Once created I cannot move it to a different location on the page, mirror it or manipulate it in any fashion. How can I design using the wave feature and still be able to apply the word to a design like I normally would in designer?